Review: 'Shrill' Stars Aidy Bryant As A Fat Woman Learning To Take Up Space Shrill, starring Aidy Bryant as a character inspired by Lindy West's book of the same name, is funny and smart, empathetic and biting, and a great example of mixing comedy with emotion. 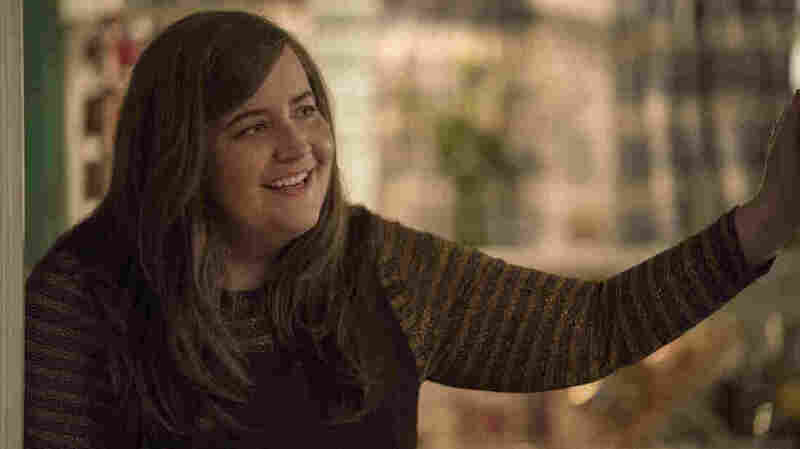 Aidy Bryant plays Annie in Hulu's Shrill. Lindy West's 2016 book Shrill: Notes From A Loud Woman is, appropriately, a holler. It's a holler of triumph, of laughter, of hurt, of anger, of joy, of frustration, of defiance ... but it is a holler. West talks about life on the Internet as a feminist and a fat woman, she talks about being loved and being at peace with her body, and she talks about learning to unapologetically occupy space, both literally and figuratively. At first glance, the Hulu adaptation Shrill, which dropped its first episodes on Friday, doesn't look like a holler. It stars the wonderful Aidy Bryant, a Saturday Night Live veteran who often comes across as a walking smile, albeit one hiding a sharp and knowing wit. Bryant has been marvelous as a buddy/sidekick in The Big Sick and I Feel Pretty, but in Shrill, the show is mostly on her shoulders, and seeing her perform such strong material is a delight. And while a certain pleasantness radiates from her, the six episodes that make up the first season are not exclusively pleasant. They are about how even a pleasant, friendly, funny, outgoing woman learns to be a loud woman. Bryant plays Annie, West's avatar in the liberally adapted story. Annie is low in the pecking order at a magazine whose editor (John Cameron Mitchell) is uninterested in her feminist leanings and finds her desire to write about them a bother. She has a best friend and roommate named Fran, played by Lolly Adefope, who urges her to hurry up and dump Ryan (Luka Jones), the schlub she's been sleeping with who won't really take her out and keeps their trysts a secret by having her sneak out the back of his house through the bushes. One of the wonderful things about Shrill is that while Ryan seems awful and unformed in many ways, he has just enough winning goober energy to make many women look at him and see in his face the hours, the weeks, the years they might have wasted on him. (Hypothetically. I suppose.) Fran is probably right that Ryan is a bad idea, and Annie knows it, but he also says funny things to her, and he is attracted to her, and he does make her feel pretty some of the time. She's not sure about her number of chances. It makes her more tolerant at first, less willing to ask for anything. Into this single-girl narrative, not that different yet from many others aside from its heroine's size, comes the first episode's complication: an unplanned pregnancy. Without giving anything away, the show's approach to this story feels honest but not didactic, and it leaves room for Annie to have a lot of complicated feelings — and for Fran to be the one who helps her sort them out. It is indeed unusual to see a lead character in a show like this played by a plus-size actress like Bryant, but her writing about body shaming and body confidence is so much a part of West's work that to omit it would have been very strange indeed. Shrill strikes a good balance between developing other aspects of Annie's personality — her relationship with her parents, this disaster with Ryan, her struggles at work — but also taking story beats to consider what it means to her to feel confident, to be around other women who feel confident, and to experience both the positives and the negatives associated with publicly claiming your own right to exist. Being fat touches all these stories, but it isn't the whole show, and it isn't the whole character. Created by West and writer Ali Rushfield, Shrill gives Annie all the best jokes, which is the most important part of a show like this. Very often, the alleged main character in a show about someone's struggles will do all the struggling, while everyone around them — sharper, meaner, less restrained, less polite — gets all the good lines. But Annie is the funniest person in this comedy about Annie, and that's as it should be. When she patiently tolerates a fitness instructor lecturing her about the thin person trapped inside her, it's not written and performed as a scene where she's embarrassed and humiliated; it's written as a scene where she's shocked that anyone is this much of a bonehead. She is always entirely aware of whatever is funny about the scene; the comedy doesn't happen to her. Later episodes dig more deeply into some of West's better-known stories, including her experiences online. There is a fictionalized take on a chapter in Shrill where she tells a story about an unpleasant run-in with the writer Dan Savage when he was her editor at The Stranger, and if you've always wanted to see what it would look like if John Cameron Mitchell played a character in part inspired by Dan Savage: I did too, even though I didn't know it. Shrill is a marvelous piece of writing and acting, a meeting of Bryant's vibe and West's. That walking smile that coexists with that devastatingly sharp writing style — that's what makes Annie a rootable, lovable, believable heroine, even when she's sneaking out the back door of someone's house.